Despite what this picture suggests, the fuzzies are actually quite familiar with balloons. Granted, the ladies are largely indifferent to them, but they’ve had the opportunity to experiment. Yuki and Rhubarb are casual balloon users. Watanuki, however, is a dedicated balloonatic. Given his bad boy image and tendency to greet any moving object–and most stationary ones–claws first, you might expect the average lifespan of a balloon in his vicinity to be measured in milliseconds. But he’s amazingly gentle and careful with them. The average is actually several hours, and the record is over twenty hours*. * We give the balloons a sporting chance and put them out of easy feline reach when we’re not around to supervise. The record does include a six hour stretch while we were asleep and the balloon caught its breath. The truly vexing thing is that ‘Nuki will not play with a balloon if he knows we have a camera handy. Shortly after the video clip above, he spotted me recording and promptly sat down a few feet from the balloon and studiously ignored it. As soon as I put the camera away, he sneered at me, walked over to the balloon, and jabbed it with a claw. Message received: the relationship between a cat and his balloon is a private one, not to be shared with outsiders. 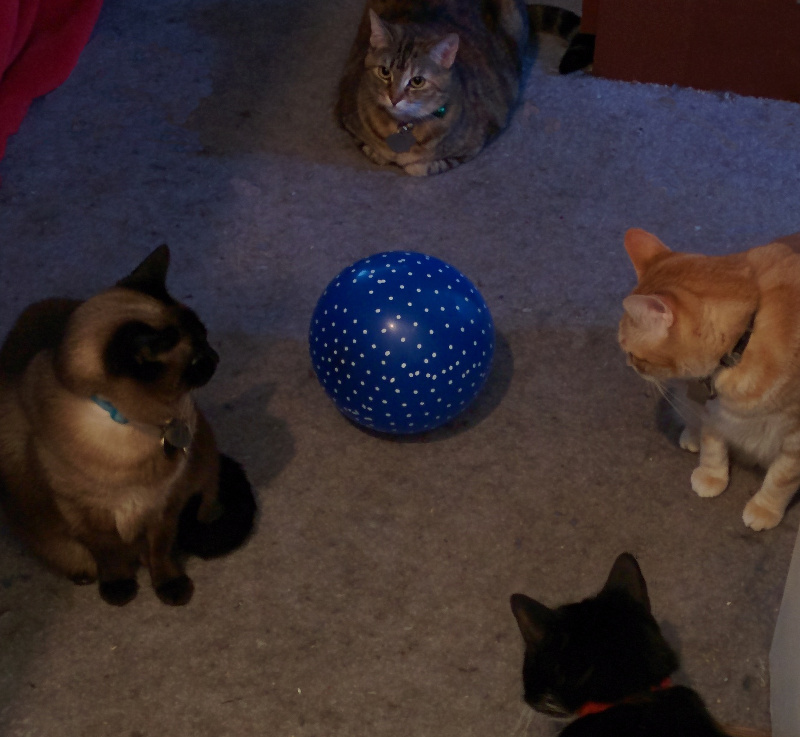 This entry was posted in Cats, Kaja, Kokoro, Rhubarb, Watanuki and tagged balloons. Bookmark the permalink.